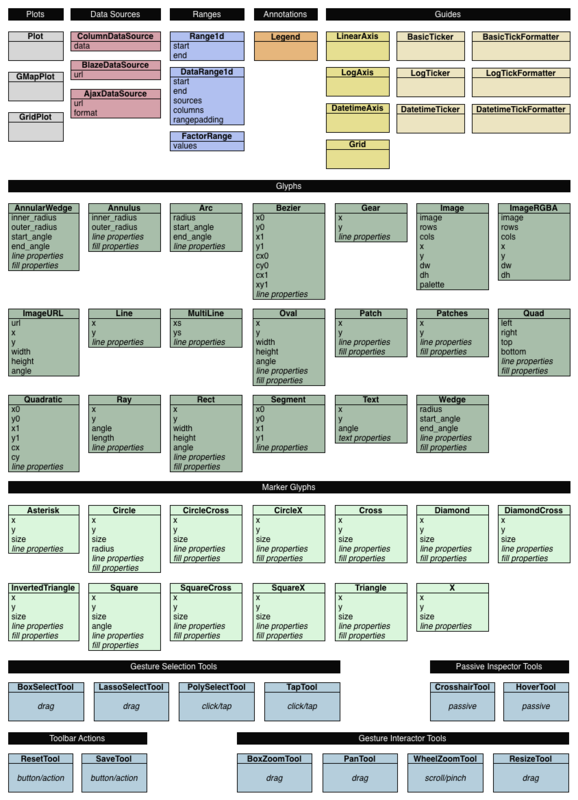 Below is a notional diagram that shows many of the most common kinds of models that comprise the Bokeh object system. To create Bokeh plots, these objects are created and assembled, and then this object graph is serialized to JSON. This JSON representation is consumed by the BokehJS client library, which uses it to render the plot. Where space permits, the attributes of the model are show inline. Not all objects are shown below; see the Reference Guide for full details. The IntProps model represents objects that have three integer values, prop1, prop2, and prop3, that can be automatically serialized from python, and unserialized by BokehJS. Technically, prop1 isn’t an instance of Int, but HasFields uses a metaclass that automatically instantiates Property classes when necessary, so prop1 and prop2 are equivalent (though independent) properties. This is useful for readability; if you don’t need to pass any arguments to property’s constructor then prefer the former over the later. The primary benefit of these property types is that validation can be performed and meaningful error reporting can occur when an attempt is made to assign an invalid type or value. There is an Any that is the super-type of all other types, and will accept any type of value. Since this circumvents all type validation, make sure to use it sparingly, if at all. See bokeh.core.properties for full details. In this case there is a placeholder property some_props , that will be removed and automatically replaced with all the properties from FillProps, each with some_ appended as a prefix. The prefix can be a valid identifier. If it ends with _props then props will be removed. Adding _props isn’t necessary, but can be useful if a property some already exists in parallel (see Plot.title as an example).